SBHCs are medical clinics that offer primary care services within or on the grounds of a school. Each SBHC is staffed by a primary care provider, other medical, mental, and/or dental health professionals and support staff. SBHCs focus on reducing barriers that can keep youth from accessing health care such as transportation, cost and concerns about confidentiality. SBHCs bill Medicaid and many are credentialed with private insurance, but students may not be denied service for inability to pay for services. Since inception, preventative health services such as immunizations have remained a core function for Oregon SBHCs. Certified SBHCs participate in the Vaccines for Children (VFC) program and offer all ACIP routinely recommended vaccines at each site. Bringing vaccines to the school results in fewer missed opportunities for all vaccines as well as preventing school exclusion due to incomplete immunization status. Parent involvement and consent is managed by frequent communication between the SBHC and home. Summer is winding down and it’s time to gear up for a new school year. That means more kids coming in for vaccines. What do you need to know about immunizations for back to school this year? If the child has received the vaccines, the parent needs to fill in the vaccine dates on the Certificate of Immunization Status, sign the form and turn it into the school. If the parent wants a nonmedical exemption for their child, they need to get education about the benefits and risks of immunization from a health care practitioner or the online vaccine education module. If you are a health care practitioner and provide education to the parent, print off and complete the Vaccine Education Certificate available at healthoregon.org/vaccineexemption (go to the “For Providers Only” section at the bottom of the page). Mark “yes” next to each vaccine you provided education about for which the parent wants to claim an exemption. The online vaccine education module is also available at the same web address. Remind parents to update immunization records with their child’s school or daycare every time their child receives a vaccine. Make sure to screen for and give all recommended vaccines when you give school-required vaccines. When a student comes in for Tdap vaccine, give HPV and meningococcal vaccines as well. Adolescents can be a hard population to reach, and you might not see the patient again for several years. And don’t forget about flu vaccine! 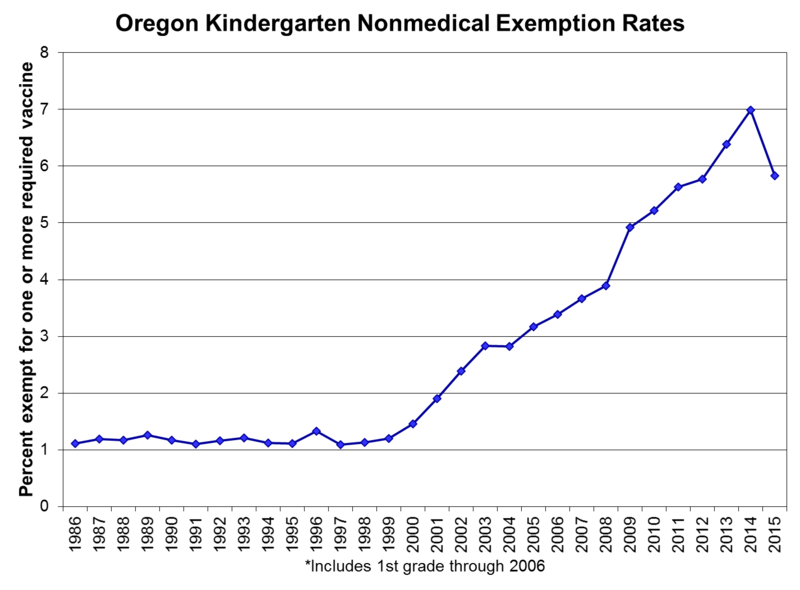 For the first time in more than a decade, Oregon’s nonmedical exemption rate decreased: 5.8% of kindergartners had a nonmedical exemption to one or more vaccine in 2015 compared to 7.0% in 2014. Check out the graph above to see the nonmedical exemption rate over time. Thank you to clinics, schools and child care programs for helping to implement the new process for claiming a nonmedical exemption, and helping protect more kids against vaccine preventable diseases! Here is some great immunization news to start the season right! !